World of Goo is a physics puzzle game where you're given a limited number of goo balls and expected to create bridge-like structures with them that eventually create a path for any idle goo balls to make their way to an exit. So, the game is a bit similar to Lemmings to a degree except instead of lemmings, you have goo balls, and instead of creating a path to the exit using blockers, builders and bashers, you create a path to the exit using goo balls. If you manage to save the minimum requirement of goo balls for a level, you can then proceed on to the next one. Pretty simple, right? Well, some of these levels are anything but. I actually managed to get a DRM-free retail copy of World of Goo when the game was originally released, which would've been almost a decade ago as this game was originally released in late 2008! In fact, World of Goo is one of those special indie games that predates the indie gaming boom of the 2010s (thanks to games like Minecraft which had its first public release in 2009) so it's interesting to see how indie games looked like prior to then. However, the copy of the game I'm reviewing is the Steam copy which I only got recently as part of a Humble Bundle on Valentine's Day this year (it must've been off the huge Humble Freedom Bundle). 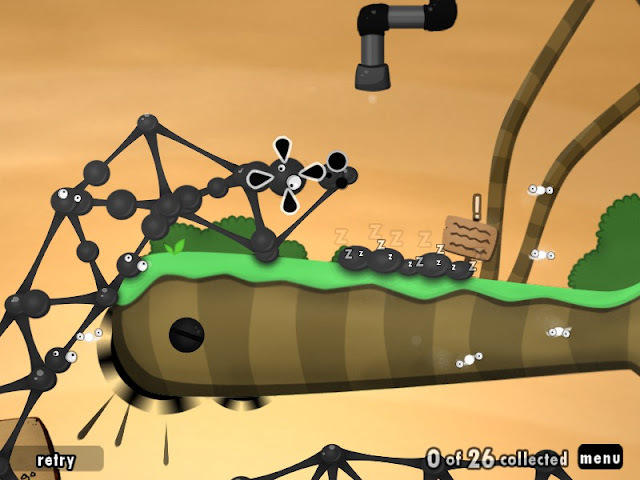 As mentioned, I liken World of Goo to Lemmings but it keeps the formula fresh by adding some unpredictability with respect to the goo bridges/structures; they tend to sway back and forth quite a bit and the larger they get, the more precarious the situation. Just like in Lemmings where you can have lemmings specialise in different roles (e.g. builder, basher, blocker, etc. ), you do eventually get to experiment with different goo ball types in this game such as flammable and re-usable goo balls. There were several times where I was about to throw in the towel in frustration after failing several attempts to complete puzzles. However, every time I was about to give up on the game, I'd finally figure out how to solve the puzzle so I suspect the game is just right in terms of difficulty (since I'm not that great at puzzle games to begin with). The game has an eclectic soundtrack with music covering many styles (again, another way the game is similar to Lemmings). It's a pretty good soundtrack and thankfully it's free to download. While I sometimes don't quite get the humour, there's very much an undercurrent of dark humour or satire here pointing fun at mega-corporations as well as the general vanity and stupidity of the Human race. The game has 8 Steam Achievements and it's going to be tough acquiring all of them (you get one achievement for completing the game). The game has no trading cards. The unpredictable nature of the goo balls, while keeping the Lemmings formula fresh, also makes the game somewhat infuriating at times since it's quite hard to predict how successful your next move is going to be (which is where most of the challenge in this game is derived from). What's worse is that sometimes you might actually be on the right track in solving a puzzle but because you placed some goo balls in the wrong place at the wrong time, you might decide to give up on attempting the correct solution and go off on a tangent instead. It's been almost a decade since World of Goo came out and while the critics as well as the players loved it when the game was originally released, the game goes up against a lot of competition in the indie games market nowadays especially when it comes to puzzle games; there's no denying that World of Goo is one of the quality indie puzzle titles out there but that doesn't hold as much weight as it may have once did. World of Goo is like Lemmings with goo balls and that's a good thing: the game is funny, has a pleasing soundtrack and is a decent challenge for those that aren't familiar with puzzle games in general. However, World of Goo is up against a lot of competition in the indie puzzle game market nowadays and while it may have been a rising star almost 10 years ago, it's not really the case now. Also, the unpredictable nature of the goo balls can be off-putting at times, so much so it might actually lead you astray in terms of finding solutions. Is the game worth $9.99 USD? : Yes. I spent 9 hours playing the game which seems like a fair amount of gameplay for $10. You're also playing what is considered one of the iconic indie games of the pre-Minecraft era so I think that counts for something.